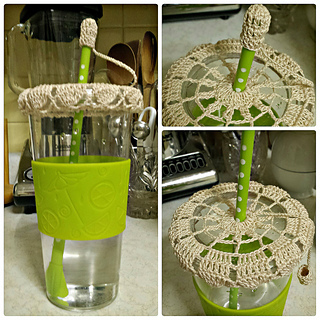 This tumbler cover features a beautiful crocheted motif with an attached mini hat for straw tip. It can be made in neutral or vibrant colors to match personalized tumblers. Fancy and great for a gift! 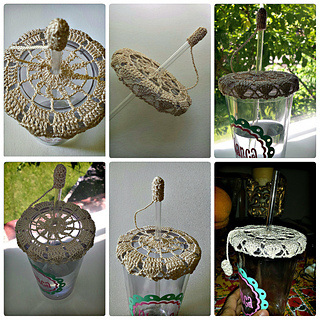 Materials: Baroque 100% Super Mercerized crochet cotton. Size 10, 46 y/380 m; 75 grams (2.5 ounces), Color Ecru. Total yardage used about 35 yds.